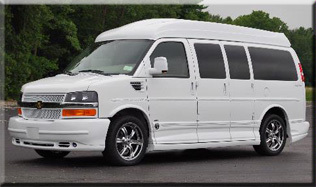 Dave Arbogast Conversion Vans has the largest selection of New and Used Luxury Vans in the country. Dave Arbogast is the original “Van Man” and a leader in conversion van sales. That means for conversion van buyers, you are dealing with a company that knows conversion vans inside and out. No one can claim their knowledge and level of service we give our customers. A luxury van is a unique automotive vehicle and Americans should demand to work with the best company in the United States for conversion vans. Whether we are located right around the corner from where you live or thousands of miles away, we want our customers to feel like part of the family. We will work with Luxury Van buyers to provide videos of the vans we have in stock and door to door delivery. The Arbogast group is located in Ohio, ten minutes from the Dayton International Airport. Our convenient location makes it easy to buy a conversion van from anywhere in the USA. Arbogast can deliver your luxury van to your doorstep or pick you up from our local airport. It starts with a phone call or email. You choose what is best for your research and your decision making process. You can call us at 1-888-436-3216 to speak with a luxury van expert. We respect your right to shop as you want. Just give us the opportunity to review the conversion vans we have for sale and how we can assist you with financing or payment plans.